It's a different strategy from a company that has previously been vigorously defensive toward its critics. In March, Amazon dropped a policy that prevented merchants from offering lower prices on other websites following an investigation request by Sen. Richard Blumenthal, D-Conn. Last month, the company scaled back some of its most aggressive promotion tactics after Sen. Elizabeth Warren, D-Mass., called out abusive business practices. And late last year Amazon raised its minimum wage to $15 following criticism of the company’s working conditions by Sen. Bernie Sanders, I-Vt.
Last year, for example, Amazon successfully fought a proposed law in Seattle that would have taxed the city’s largest businesses to address homeless issues. In 2011, Amazon was slapped with a $269 million tax bill in Texas and then threatened to shut down a warehouse there before reaching a settlement. And TechCrunch reported in August about a small army of apparent employees on Twitter who do nothing but promote how great it is to work in the company’s warehouses. Galloway, an outspoken critic of Amazon, said the company’s effort to soften its image is its way of telling regulators, “Don’t break us up.” Galloway has argued that, for the sake of competition, Amazon needs to be split up. Politicians from both sides of the aisle have been making the same case not only for Amazon, but Google and Facebook as well, while regulators in Europe have also stepped up their scrutiny over the industry. 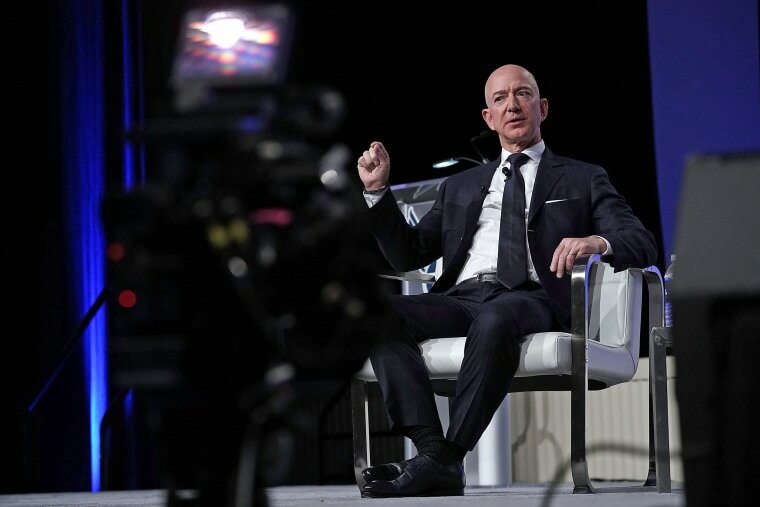 President Trump, who’s been going after Amazon and CEO Jeff Bezos since his campaign, told Axios that his administration is looking into antitrust violations by the company. Aware of what’s coming, Amazon is taking “preemptive action,” said Kartik Hosanagar, a business professor at the University of Pennsylvania’s Wharton School of Business. Even if presidential candidates like Warren and Sanders don’t get elected, their campaigns could have a huge impact on public sentiment and influence future regulation. “This is a good strategy by Amazon to address these comments early before one of the candidates makes Amazon the poster child of what they refer to as the problems with Big Tech,” Hosanagar said. Bezos’s annual shareholder letter this week may have reflected some of the company’s concerns. Unlike past letters that mostly focused on management principles and long-term thinking, Bezos chose to highlight how much Amazon is investing in helping other businesses grow, while reminding investors that the company accounts for only a small piece of the total retail market. He’s well aware of the perils of being too closely allied with his peers in Silicon Valley, and stressed in an internal all-hands meeting last year the importance of telling a distinguished story so that Amazon doesn’t get “bundled together” with them. Erik Gordon, a business professor at the University of Michigan, said Amazon’s softer image could help, not just with regulators, but also for recruiting, retention and even keeping a certain group of investors happy. The negative response among many New Yorkers to the company’s HQ2 plans, which were ultimately scuttled, shows that the brand isn’t as beloved as it once was.